From the oceans to the mountains, we at Sunday Crew understand the love of outdoor activities, but also realize these activities expose us to harmful sun rays that can cause Melanoma. Melanoma has a devastating impact on lives and communities around the globe and is increasing at an alarming rate. Sunday Crew Foundation was founded to rid the world of this terrible disease. Through hosting charity sporting events around the world, we bring communities together to raise awareness and promote prevention and early detection of Melanoma. Our goal is to expand our events to areas most impacted by the disease and provide much needed funding to the most promising Melanoma research. Our goal is to educate those spending time in the sun on how to protect themselves. Not only to educate, but equip people with a means to protect themselves. 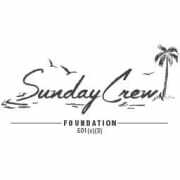 Beyond protecting your skin, proceeds from SUNDAY CREW apparel will be donated to melanoma foundations and sunscreen manufacturers to better promote sun awareness. Would you recommend SUNDAY CREW INC?